Now why would I go ahead and review a liqueur? Well, it is a product from one of the very few Norwegian distilleries. Also it is a product matured in oak. 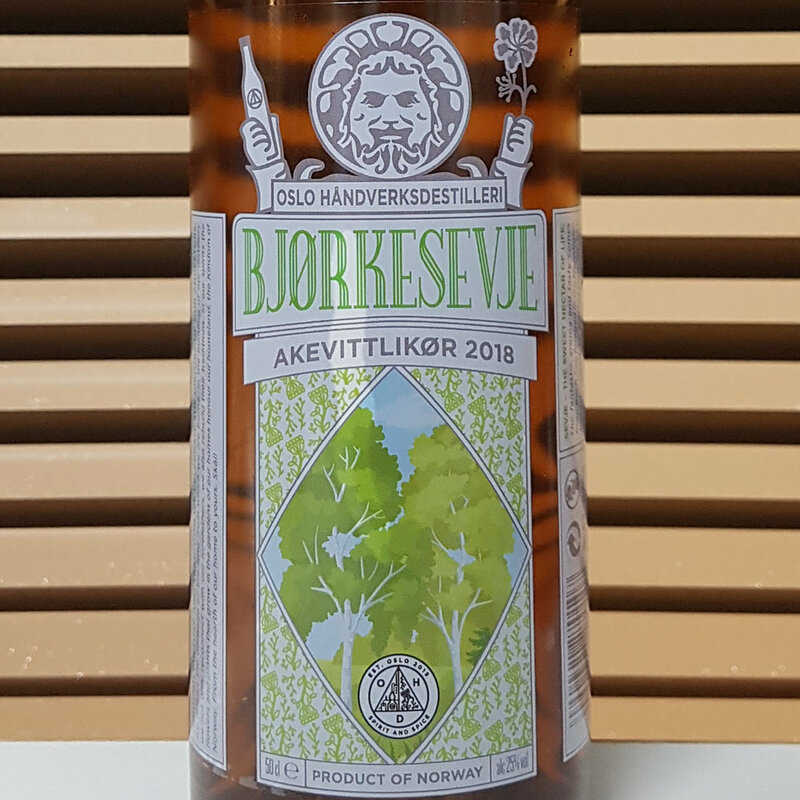 The Bjørkesevje Akevittlikør 2018 ("birch sap liqueur") is a limited edition of 1000 bottles (50 cl), produced by Oslo Håndverksdestilleri (OHD). A little over a year ago the distiller at OHD, Matt, went forest walking with a local cook by the name of Gaute who was out to collect birch sap. Matt was fascinated by the experience and soon had 400 litres of birch sap gathered from around 50 trees about 2 klicks from the distillery itself. Back at the distillery the birch sap was slowly heated and "cooked" to a syrup, which was then mixed with the distillery's own 60 % ABV aquavit. Finally the liqueur was left to mature for 12 months in ex-aquavit casks. With maturation done the spirit was further sweetened with Norwegian honey and watered down to 25 % ABV. A few local restaurants here serve this birch sap liqueur with cheese as a dessert. You can buy the Bjørkesevje Akevittlikør 2018 in Norway at NOK 400 for a 50 cl bottle (10188802). Nose: The fresh and earthy aromas of a Norwegian forest on a clear spring morning. Soft spices, milk chocolate, some vanilla and a mild fruitiness. Taste: Delightful and delicate, well-rounded. Sweet and rich. Earthy with apples and a generous helping of honey. Finish: Medium long finish. Sweet, with lots of honey all the way. Vanilla and sweet oranges. A mild touch of oak towards the end. Comments: Quite unusual, yet very rewarding. Also, my intense birch pollen allergy did not kick in!